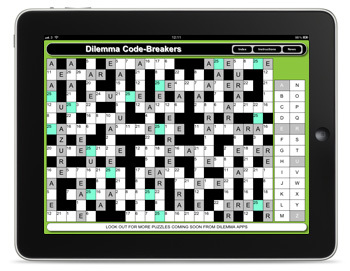 CodeBreakers are extremely addictive word puzzles that have been baffling puzzlers around the world for many years. Each letter of the alphabet has been replaced by the same number throughout the puzzle. Simply decide which number has replaced each letter by using your vocabulary skills (proper nouns are not allowed in these puzzles) and work your way through the puzzle, until you have broken the code for all 26 letters. This App contains 12 FREE puzzles and additional packs of 40 can be purchased. Submitted to Apple on the 19th January 2012, it should be available soon!